Please Note: The Vivotek FD8134V is no longer manufactured and has been replaced by the Vivotek FD8154V. The Vivotek FD8134V vandal proof IP dome camera has a compact design loaded with high end features. The Vivotek FD8134V vandal proof IP dome camera features a 1 Megapixel CMOS image sensor paired with a fixed 3.6mm lens for excellent image quality. This camera is capable of recording in 1280 x 800 video resolution at up to 30 frames per second. The built-in infrared illuminators have an effective range of 10 meters / 32 feet for low light environments. The FD8134V is enclosed in an IP66 and IK10 rated housing to fully protect it from harsh weather conditions and acts of vandalism. The 3 axis mechanical design allows it to be mounted to either a wall or ceiling. A few more features of the FD8134V include POE 802.3af compatibility, a Removable IR Cut Filter and a Built-in Micro SD / SDHC card slot for local storage recording. The Vivotek FD8134V includes a 32 channel central management software and is also fully compatible with NUUO IP Camera Software for users who want to get the most out of their cameras. 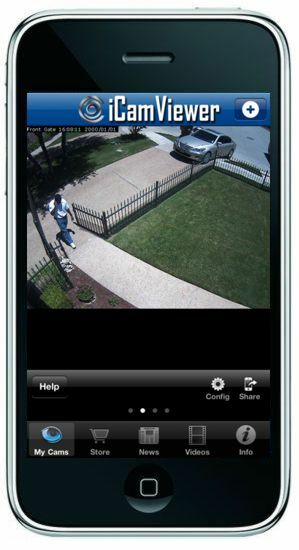 The Vivotek FD8134V is compatible with the Free iCamViewer app for network cameras.